Today I bring you something super indulgent: No Bake Nutella Cheesecake Cherry Parfaits! Nutella + Cheesecake + Cherries + Amaretto Cream + Toasted Almonds. No baking involved. Rich and Creamy. Let the cream cheese and Nutella come to room temperature. In the bowl of a stand mixer fitted with a whisk attachment beat the cream cheese and powdered sugar until smooth. Then add the Nutella to the cream cheese mixture while continuing to beat until combined. Divide the Nutella mixture between the 4 glasses and put them in the fridge for at least 2 hours. In a small pot bring 1 cup cherry juice and 1 tbsp sugar to a boil. Mix cornstarch and amaretto in a little bowl until the cornstarch is completely dissolved (you can substitute the amaretto with cherry juice if you don't want to use alcohol). Add the cornstarch mixture to the boiling cherry juice and let it cook for one minute so the cornstarch can thicken the pudding. Turn off the heat and mix in the sour cherries. Let the Cherry Pudding cool off completely! Leave the cream in the fridge until you're ready to whip it. I suggest you start whipping the cream shortly before you assemble the parfaits. Add the cream to the bowl of a stand mixer fitted with the whisk attachment (you can also use a metal bowl and a hand mixer). Add the amaretto (or almond flavouring if you don't want to use alcohol) to the bowl. Begin whipping the cream at a medium speed. Continue for 7-8 minutes. The trails in the cream will become thicker and thicker. The cream is ready when the peaks will hold firmly if you take the whisk out. Don't overbeat the cream or you will end up with butter. The Nutella Cheesecake in the glasses should be firm by now. 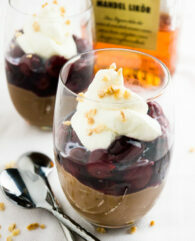 Divide the Cherry Pudding between the glasses and top each parfait with cream. Sprinkle toasted almonds on top. 1. These Parfaits can be covered with plastic wrap and refrigerated for 1-2 days after preparing. 2. I used canned sour cherries for this recipe and reserved the juice while draining the cherries. My 24 oz. glass cherries had approximately 12 oz. Cherries and 1 cup cherry juice inside. If you want to use fresh cherries I would recommend adding them to the boiling cornstarch-juice and boil it for 1-2 minutes longer.